A chemical gradient is a region of change in surface chemistry between two points on a substrate. Chemical gradients may be used in various experimental scenarios to probe the effect of differing surface chemistries in a single experiment. This article discusses the application of angle-resolved XPS in the characterization of materials with an ultra-thin co-polymer layer with a chemical gradient along the co-polymer surface. In this experiment, the chemical gradients produced were used to immobilize the antibody bovine IgG at their surfaces. The resulting surfaces were then characterized using XPS and the Thermo Scientific Theta Probe was used to make the XPS measurements. A silicon substrate with a native oxide at its surface is put inside a box that has a slit in the lid. The substrate is attached to a precision, computer-controlled drive such that the substrate surface passes underneath the slot at a fixed rate. As shown in Figure 1, the entire arrangement is positioned within a plasma chamber. The feed of two volatile monomers into the plasma is controlled by computers so the proportion of each can be varied as the substrate is passes under the slot. In this example, the monomer 1,7-octadiene is present in the plasma when one end of the substrate is below the slot. The amount of octadiene is decreased as the substrate is moved and the amount of acrylic acid monomer is increased until only acrylic acid is present in the plasma. 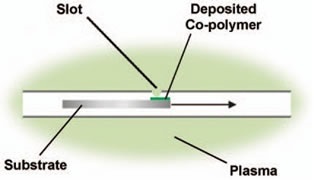 This method deposits a plasma polymer (pp) layer on the substrate surface, with one end of the substrate having an area of pp-octadiene, the other end having an area of pp-acrylic acid, and a plasma co-polymer of these two materials in between. The intended structure of the material is shown in Figure 2. 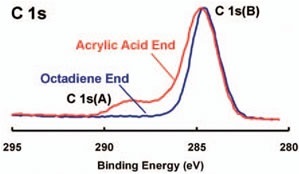 As shown in Figure 3, an XPS spectrum line scan was obtained along the gradient from point A on Figure 2 (pp-1,7-octadiene) to point B (pp-acrylic acid). 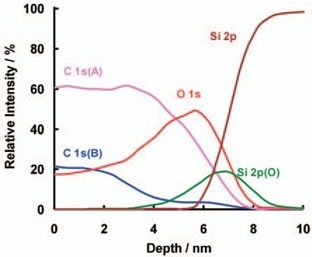 As shown in Figure 4, the Si 2p spectrum is independent of the position on the sample from which it was acquired. 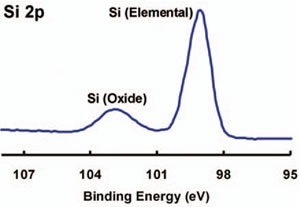 Both elemental and oxidized silicon are present in the spectrum, indicating a very thin plasma polymer layer. Figure 4. A typical Si 2p spectrum from the sample. This shows little or no variation as a function of position on the sample. However, the C1s spectra vary as a function of the analysis position. Figure 5 shows the spectra, one from each end of the substrate. This confirms that the surface layer is a hydrocarbon at the pp-octadiene end of the sample and contains C-O and O=C-O bonds at the other end. This is completely consistent with the model shown in Figure 2. 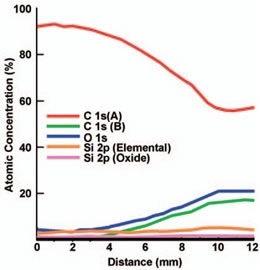 Figure 6 shows the atomic concentration profile along the sample. It clearly shows a decrease in the hydrocarbon component of the layer as the oxygen-containing organic material increases. Each end of the profile has a region where the concentrations remain constant. The behavior displayed in Figure 6 is reflected in Figure 7, where the atomic concentration of carbon in each of two chemical states and oxidized silicon is displayed by three 2D maps. In the C 1s maps, the chemical gradient along one axis and the uniform distribution of carbon along the other axis is clearly shown. 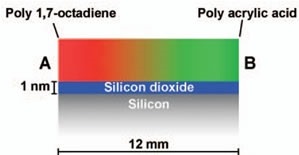 A gradient in the oxidized Si distribution is apparent, although this is due to the co-polymer layer not having a uniform thickness and the signal from the silicon being stronger where it is below a thinner part of the layer. Angle resolved spectra over a 60° range can be collected in parallel from each point on the linescan using the Theta Probe, without tilting the sample. Using these data, it is possible to determine the thickness of the co-polymer layer at each point on the linescan and to produce a non-destructive depth profile. 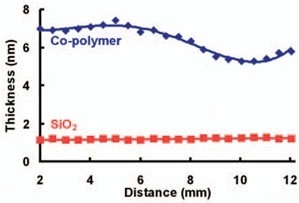 The thickness of the co-polymer and the SiO2 layer as a function of distance along the linescan is shown in Figure 8. The Multi-overlayer Thickness Calculator, an integral part of the Avantage data system was used to calculate these. From Figure 8, it is clear that the co-polymer layer thickness decreases by 2nm as the acrylic acid content increases and at each end of the sample, there is a region of constant thickness. The measured SiO2 thickness is independent of the position on the sample. The data were obtained from 16 angles at each point on the line, which was sufficient for the construction of a non-destructive depth profile. An example of such a profile obtained from the data collected 7.5mm along the linescan is shown in Figure 9. This is the point at which the proportions of 1,7-octadiene and acrylic acid in the plasma feed are similar. This profile clearly shows that neither monomer segregates to the surface, as the proportion of carbon in each of the chemical states is virtually independent of depth. 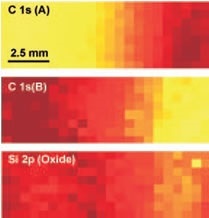 The Si 2p (oxidized) forms a discrete layer at the interface between the plasma co-polymerized layer and the silicon substrate, indicating a continuous copolymer layer. The objective of this experiment is to produce an antibody concentration gradient across the surface, regulated by the chemical gradient. After preparing the gradient, the antibody is immobilized in a two-step process. Firstly, the surface is treated using N-hydroxysuccinimide (NHS) and N-Ethyl-N'-(3- dimethylaminopropyl) carbodiimide hydrochloride (EDC) to produce a succinimide layer, of which the concentration depends on the acid group concentration at the co-polymer surface. Next, the surface is treated with the bovine IgG antibody, which is anticipated to covalently couple to the EDC/NHS, but not to the surface of the polymer. In this way, a concentration gradient of immobilized antibody material can be prepared. Control measurements were carried out on the chemical gradients. Initially, measurements were made on the EDC/NHS treated surface. The second control was to treat the gradient with bovine IgG only. XPS was used to analyze the EDC/NHS treated surface. The plasma co-polymer in the chemical gradient does not contain nitrogen, while the EDC/HNS does contain nitrogen, meaning the intensity of the N 1s signal in the XPS spectrum is related to the EDC/NHS concentration. 2D maps of the N 1s and C 1s atomic concentration obtained from a chemical gradient sample treated with EDC/NHS are shown in Figure 10. The C 1s distribution is very similar to the one shown in Figure 7. As expected, a greater N 1s concentration can be observed at the end of the sample where the acrylic acid concentration is greatest. Here, the bovine IgG antibody was used to treat the chemical gradient. A useful marker for the antibody is provided by the N 1s XPS peak. Figure 11 shows a map of the nitrogen atomic concentration. The part of the surface with the highest concentration of pp-octadiene has the greatest nitrogen signal, indicating non-specific adsorption of the antibody. This may be because the non-specifically adsorbed antibodies are removed from an acidic surface more easily. In order to prepare this sample, the antibody was added to the EDC/NHS treated surface. The N 1s XPS signal was then mapped. The results obtained are shown in Figure 12, where no clear gradient is visible. This indicates a mixture of specific adsorption at the pp-acrylic acid end of the chemical gradient which has the greatest EDC/NHS concentration and non-specific adsorption at the other end of the gradient. These results suggest that the coupling reaction does occur in the desired way, but that some method for removing the non-specifically adsorbed antibody from the hydrocarbon surface must be found. XPS and ARXPS are robust tools for characterizing chemical gradients and immobilized antibodies. By using XPS, the presence of the chemical gradient was confirmed. In addition to chemical state information, the methods provide information on the distribution of the materials within these layers. 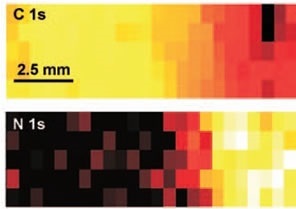 Non-destructive depth profiles can be used to measure the uniformity of coverage and, if present, to detect the segregation of material to the surface. The thickness of the layer can be measured using an ARXPS linescan. In this experiment, the thickness was found to depend on the co-polymer composition. For antibody immobilization, the XPS data has shown EDC/NHS coupling correlates with increasing acid group concentration and for non-specific antibody adsorption, the correlation is opposite. The efforts made to immobilize antibodies on the gradients were hampered by the non-specific effects. To reduce this non-specific binding, additional work is required. Thermo Fisher Scientific would like to thank Kristina Parry and Jason Whittle of Plasso Technology Ltd., UK (www.plasso.com) for supplying the chemical gradient surfaces analyzed in this work.